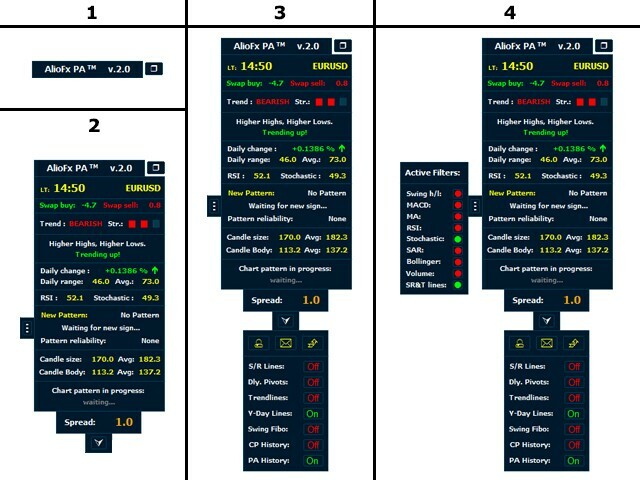 AlioFx Price Action analyses trend, day candle, ob and os condition, 40 Japanese candle patterns with 9 customizable filters, last closed candle analyze, 23 chart patterns, automatic support and resistance lines, daily pivot points, trendlines, yesterday high and low lines and Fibonacci retracement. Alert, email and mobile notification for newly formed Price Action patterns and Chart patterns. 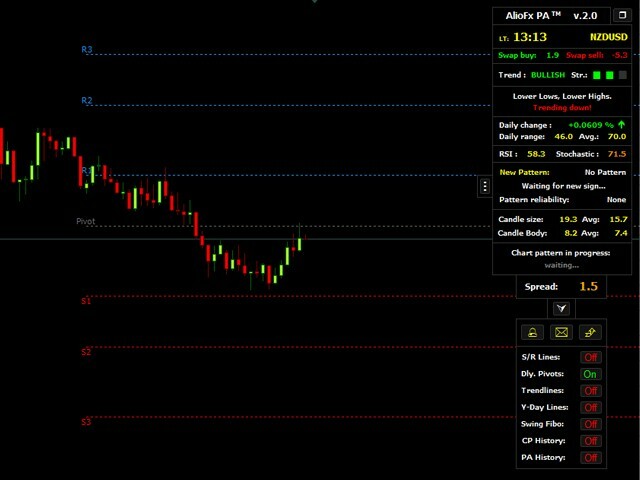 Panel xy positioning, minimize button and panel options for quick turning on/off filters, alerts, pa history, s/r lines, yesterday h/l lines, last swing Fibo and trendlines. And, almost everything is customizable. Filter Settings - Here you can turn all of the 9 filters on or off. Chart Settings - Here you can select between Local and Broker time to be displayed in the panel. Daily Average bars - How many bars should be used for daily average calculation. Show trendlines - You can switch trendlines on or off. Choose trendlines color, style and width. Show PA on chart - If this is false you will only see the new formed patterns in the panel, if true, you can see them on your chart as well. PA history candles - The number of candles to be checked for patterns. Remember, if you set a very big number it may slow your platform considerably. Yesterday High/Low Lines - If true, it will show you the previous day high and low lines on the chart. 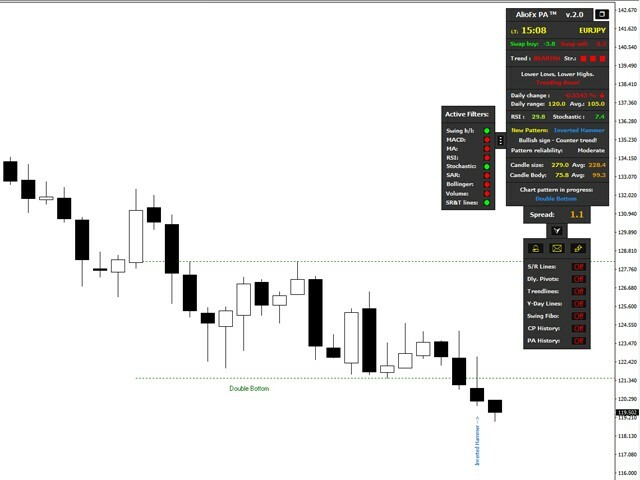 Show Last Support and Resistance lines - If true, it will show you last support and resistance lines on the chart. 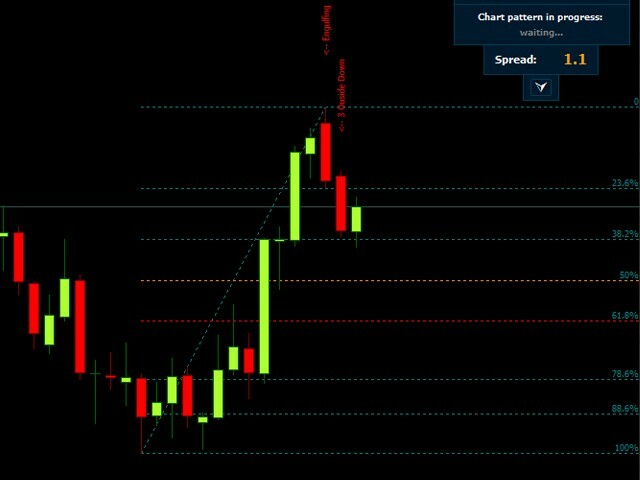 Show Last Swing Fibo Retracement - If true, it will show you the last swing Fibonacci retracement on the chart. Notifications Settings - Here you can set Alert, Email and Push(mobile) notifications on or off. Panel Settings - Here you can position the panel on your chart where it best suit you. Panel Colors - You can change almost every color of the panel and texts. Pattern Settings - You can set what distance from the candle the text appears, font, font size and pattern colors. 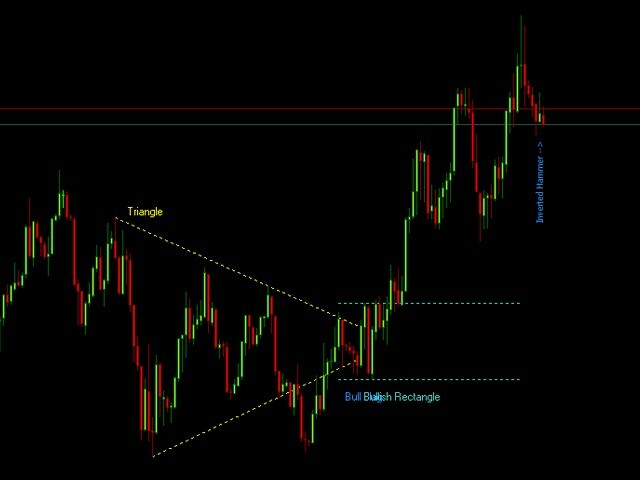 Bullish Pattern Settings - You can set each bullish pattern on or off. If they are off they will not be shown on your chart. 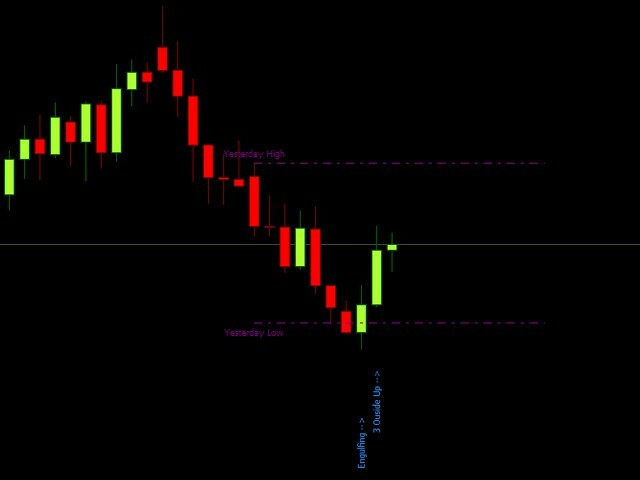 Bearish Pattern Settings - You can set each bearish pattern on or off. If they are off they will not be shown on your chart. 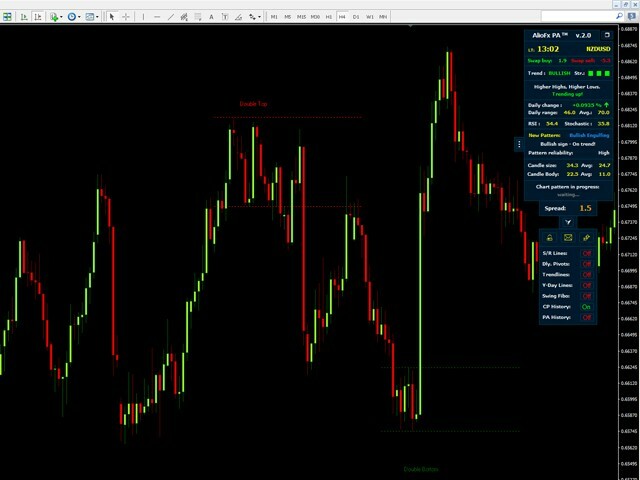 Chart Patterns Settings - Turn on/off all patterns or show/hide the one you want. Chart Pattern Colors - Choose color for every pattern. Note: It is not necessary to modify any of the settings for the indicator to work. Fixed a bug with minimize/maximize button. Fixed the problem on Strategy Tester after the MT4 last update. I've moved calculations from OnTimer() to start(). OnTimer() doesn't work anymore in Strategy Tester. I've used it to make the indicator work faster. - Fixed some issues with Windows text DPI scale. - Renamed all the objects to prevent interfering with other indicators or EA's. - Added option to leave new objects on top(that is preventing objects to be on top of the panel). You can change this option if you experience any interference with other indicators or EA's. 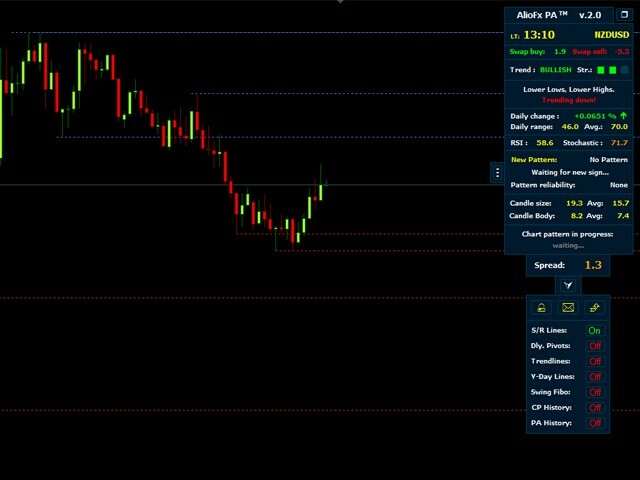 - Added option to stop the indicator to put the chart on foreground on initialization (that is also preventing the chart to be on top of the panel).